We opened our doors as The ARMory in 2009 and started working the process. Our clients were fired up and inspired by the progress they were making. We kept moving forward, and by late 2010 we had assembled a toolbox full of over 500 different exercises to build the athleticism needed to support our velo enhancement program. But we had a problem. I knew we needed to do the bulk of our work in the ATP/CP energy system (0-14 seconds), but I also knew there was no way all 500+ exercises were specifically adding power that translated directly to the mound. By all measure, we were working hard, but I wasn’t sure we were working as smart as we could. 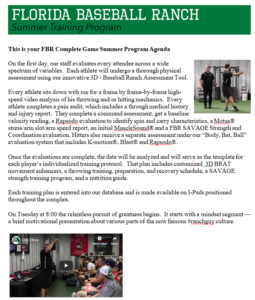 So I hired a computer guy and paid him way too much money to create a customized class registration/workout planning/result documentation program that would allow us to track in real time each athlete’s performance on every exercises. The program also posted the personal best records of every athlete on every drill. We built the 2 hour classes in advance. Each session included a mindset segment, a dynamic warmup, about 45 minutes of individualized throwing, and before a 15 min cool down/recovery segment, we executed a 45 minute workout we called “massive power building”. When a player signed up for a class, his name would automatically appear on a spreadsheet broadcast to a 60 inch HDTV on the wall. The exercises for that day were listed across the top, and beside each name were 2 rows. The top row was blank and the bottom row displayed the athlete’s personal best record on each scheduled exercise. When the workout segment began, we would position the 8 class participants in 4 stations around the room. At every station, one guy would perform the assigned exercise attempting to get in as many reps as he could in 10 seconds, trying to break his personal best record, while his partner counted. When the 10-second horn sounded, every station reported and the results were immediately entered into the database. Back then we always had 3 instructors teaching a class of 8 players. The instructors were actually unpaid interns who were trading work for training time. We usually had one intern on the floor with me leading the exercises, and another sitting behind the desk recording the information. We called that guy “the scribe”. All the interns hated being “the scribe”. You see, we were operating in a space of only about 1800 ft2, and the speakers for the stereo system (which were always set on max output) were right behind the head of the scribe as he sat at the desk. When the horn sounded the scribe would verbally poll every station for the results during the brief rest period between groups. The loud music made it tough for the scribe to hear the reports, and inevitably there would be a guy not paying attention or to shy to shout above the noise. And heaven forbid the scribe should enter the information in the wrong block on the spreadsheet. That would shut the entire workout down until he got it fixed, and that was very stressful. So our unpaid interns were paying each other so they didn’t have to scribe. This process continued much to the painful chagrin of the intern staff for 2 ½ years. “I need more data.” I would respond. The truth of the matter was that I wasn’t exactly sure what I was going to do with the results we had gathered. After 2 ½ years, I thought we had collected enough information to get a true reading on how we were doing. At the time we had 16 guys who had broken the 90 mph threshold and a bunch of guys who hadn’t. We asked the computer to analyze and report which exercises our 90 mph guys were significantly better at than the “not 90” guys. My thought was that if we could identify the specific exercises the 90 guys did better, we could have the “not 90” guys focus on those exercises and their velos would improve. I ran the numbers at night, alone so the interns wouldn’t see. And the first time through, the results were devastating. They showed no significant difference on any of the exercises between the 90 guys and the “not 90”guys. So I did what any good scientist would do… I told no one. Looking at the exercises individually had weakened their influence on the statistics. If I grouped them into categories, maybe they would show more strength and we’d find some significant results. I went to work and began placing all the exercises into one of six different categories. This time when I ran the numbers, the evidence was clear. Our 90 guys were far superior in 4 different types of exercises than their “not 90” counterparts. We labeled them the Fab 4 Pillars and immediately began reorganizing all of our pre-scripted workouts. We made sure that 80% of all of our workouts were done in one of the 4 pillars. At the time of the completion of this pseudo-study, we had 16 guys throwing 90 mph. That was in April of 2013. By August of that year, 43 more students had eclipsed the 90 mph threshold. Later, we built a weight room and added lifting to our program. We infused our gym workouts with the 4 pillars concept. We took traditional weight lifting and turned it on its ear. Using the 4 pillars to maximize the specificity and functionality of the workouts, we are building true power that translates to increased velocity and durability on the mound. And the results have been incredible. At the time of this writing, we have seen 163 pitchers surpass the 90 mph mark (measured on an indoor mound with a Stalker Pro 2 radar gun). Last year Cole Ragans, a team USA lefty from North Florida Christian School entered the fall of his senior year at about 88-91 mph. Knowing a velo bump of 2-3 mph would put him in a better draft position, his high school coach, Mike Posey, integrated our Fab 4 Pillars workouts into Cole’s fall/winter training. Cole found the velo he was looking for and was drafted in the first round of last summer’s MLB Amateur draft. His coach attributes much of Cole’s success to the shift to the 4 pillars. Don’t take my word for it… Here’s Coach Posey himself. If you’ve been to one of our camps or you’ve trained for any length of time in our Summer or Winter Training Programs, you know the answer. If not, then give us a call at 1-866-STRIKE3 (866-787-4533) and we’ll get you set up with a comprehensive assessment and a customized program that will include all the training you need on the Fab 4 Pillars of Explosive Pitcher Development. Our next camp is Jan 21/22 and then we’ll wrap up the 2016/17 season with our final camp on Feb 11/12. CLICK HERE to learn all about it, or give us a call and we’ll be happy to answer any questions you might have.